Enter My Wild Ant Wood Here. "Go to the ant, thou sluggard; consider her ways, and be wise. Which having no guide, overseer, or ruler, Provideth her meat in the summer, and gathereth her food in the harvest." (Proverbs 6: 6-8). Spoken by the wise King Solomon to the lazy youth of his day, as an example of how they should work and live like the hard working social insects. Please read the copyrights page if you wish to use this site for educational or other purposes. Thank you! Ant Hill Wood was mainly concerned with the study of British ant species when it first sprouted forth back in 2005 under the old name of Wood Ant's Hill; but since 2006 it has grown considerably, and now contains photos and information on several ant species which are not native to the British Isles. So it has now grown to become more involved with ant species from around the world; and so my fellow ant lovers, I welcome you all to the fabulous world of Myrmecology! I hope you will enjoy Ant Hill Wood and take delight in the information to be found herein, which although is aimed mainly at the novice ant lover and is not meant to be an in-depth study of Myrmecology (The study of ants) as I know many young children love ants; and I first got started on ants around the age of 10 years of age, but I am sure it will be of interest to all who browse through its pages and enjoy reading the information and photos on this site of mine. 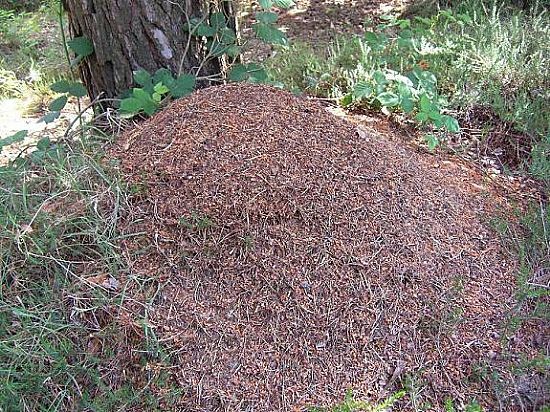 This next photo shows a typical nest mound made by the wood ant Formica rufa. This was taken by myself in June 2009 while out with my wife, who was making a video of this wood ant species at the time. It is an incredible ant to watch and study in the wild, and the F. rufa group are the largest ants native to the British Isles, which makes them very impressive indeed to observe on their foraging trails. For further enjoyment of this little adventure of ours, please view my Links page, where you'll find all of my ant videos. Ant photos placed on this site have been taken by myself, or my wife; unless otherwise stated, where they have been credited to the individual photographer who took them, as their photo donations are greatly appreciated. This year 2017 I have started keeping Asian Camponotus and also a colony of Yellow Crazy Ants. 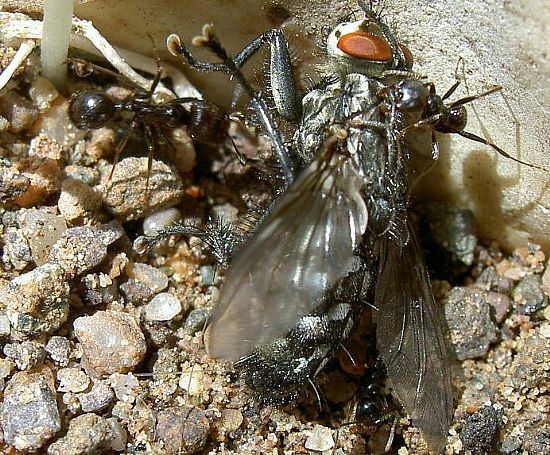 Below is a video of this 2 queened colony. I can be contacted about my site only by those who join the Ant Hill Wood forum, although I do reserve the right not to reply to questions if I consider your message to be inappropriate or offensive. Please remember this prior to contacting me, as I prefer ant keeping hobbyist questions to be discussed on the forum. This site is fondly dedicated to my much loved, and sadly missed, dear departed father who died in 2002 following an operation for stomach cancer. By getting me to help him in his garden, it was he in a roundabout way that led me to the study of all kinds of insect life; and the eventually studying and keeping ants. I thank my Dad for allowing me to keep ants inside his home and for allowing me to release ants into his garden which was his pride and joy; and also to my wife Jenny for letting me keep ants in our spare bedroom over all the years we have been together. My wife is from Powys in Wales, and went to Brecon High School; but lived in a small village just outside of the town of Crickhowell when we first met in 1979. A very big THANK YOU goes to a lovely lady and good friend, Sue York, who lives in North Wales. Sue is the creator of the lovely ant illustrations which appear on my "Honey the Ant" stories. And finally a big thanks goes to a dear departed friend of my wife and myself, that great Welsh singer and comedian Sir Harry Secombe who we met when he came to perform Pickwick here in Chichester. 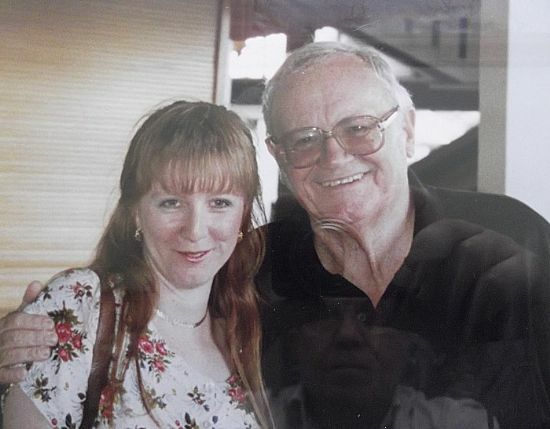 We have fond memories of you Harry, and photos of you hugging Jenny to remember you by; and you truly were a lovely man. GOON, but not forgotten mate! My deepest thanks goes to everyone who contributed in their own special way to this site, you're simply the best!! This site is about our pet dogs made recently by my wife Jenny. Finally on my home page, I would like to strongly point out my desire on just how important I feel it is to save our world and its wildlife. Not just for our own sake, but for the survival of all life on this lovely planet upon which we live and the longevity of Mother Earth herself. Nature is a glorious thing, and we humans are supposedly the guardians of the planet with the most knowledge and superior intellect on planet Earth (though sometimes I find this to be a matter which is rather debatable, owing to our often destructive nature)? So isn't it up to us all to do whatever we can to save our plant and animal life from extinction; and make our world safer, and to give it, and everything that lives upon it a better future? Of course it is! If we wish for our species to still be living on this planet for the next million years and beyond, then we all have a duty to stop blowing the hell out of each other. Stop polluting poor old Mother Earth and start doing what we can to save all the wildlife that is fast becoming endangered; such as Whales, Tigers, Pandas et cetera; the list goes on and on. We must do anything and everything we can, as it is up to us to make the decision now to preserve life as we know it, as tomorrow may be just one day too late. There is so much we can do, as it's not just about global warming and saving or finding cleaner alternative energy for our future needs; but we should be looking around and considering the needs of our planet and every living thing that lives on it. Too many of our younger generation throw away plastic bottles, cardboard cartons or aluminium cans into our hedgerows and woodlands when it is a simple matter to take it home and recycle it. Too many trees are cut down to create more land which depletes our oxygen levels, and carbon emissions are way too high and lead to respiratory problems. So none of us should adopt that "live for today and let tomorrow take care of itself" who cares kind of attitude, as there may come a time when tomorrow never comes and the human race, and quite possibly all other life will be gone from this planet forever. No matter what age you are, think carefully about the future consequences of your actions, and if you really want future generations of children living in a waste land with no wildlife or beautiful countryside to enjoy? I know which kind of world I prefer! So make your choice and don't only live for the here and now, or you may just live to regret it! !